At the recent G-7 Summit meeting in Quebec, the first such summit ever to fail to produce a joint communiqué, President Trump served notice to America’s allies that his country had no shared interests that deserved precedence over boosting U.S. net exports. Trump lashed out at his Canadian host over milk tariffs, which account for 0.2 percent of U.S.-Canada trade, while telling the French president that the EU was “worse than China” on trade. 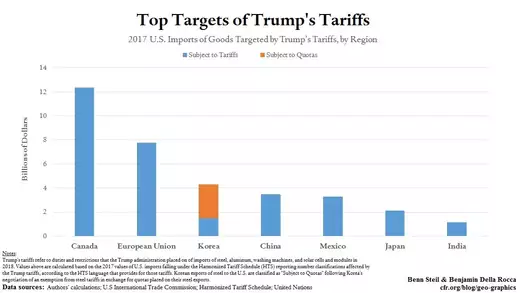 While it is easy to dismiss such language as characteristic Trump hyperbole, weaponized to soften up negotiating partners, it is notable that the president’s recently imposed tariffs on steel, aluminum, washing machines, and solar panels actually reflect, remarkably, “worse than China” thinking. As we show in the graphic below, Canada is by far the hardest-hit by the tariffs, with over $12 billion of annual exports targeted. ­­­The EU is second, at just under $8 billion. China, a far more grievous transgressor of trade rules and norms, is way back there at under $3.5 billion. As we’ve argued elsewhere, Trump appears to be targeting allies as a means of rupturing their mindset—convincing them that they are no longer deserving of American coddling just because of their geopolitical status. The big question Canada and the EU must answer for themselves, now, is whether Trump is an unfortunate temporary anomaly, or merely the first in a coming succession of “America First” presidents.